The first glimpse of the moon’s transit of Earth from the Deep Space Climate Observatory was released Wednesday by NASA, which runs the Earth-watching camera on the NOAA-led spacecraft launched in February. The U.S. Air Force is also a partner on DSCOVR. The images from DSCOVR are the sharpest views ever taken of Earth and moon’s cosmic dance, showing the gray airless moon passing between the Earth and the observatory’s position at the L1 Lagrange point about one million miles from the sunward side of Earth. The craft’s Earth Polychromatic Imaging Camera, or EPIC, instrument captured a series of images July 16 to compose the video. The images were captured between 3:50 p.m. and 8:45 p.m. EDT (1950-0045 GMT), according to NASA. The north pole is on the upper left, and Hurricane Delores is seen churning off the west of coast of Mexico. EPIC is one of several instruments aboard DSCOVR, which is primarily designed to measure the solar wind streaming from the sun toward the Earth and provide early warning of large geomagnetic storms, which could disrupt electrical grids, communications, air travel and satellite operations. Engineers processed a series of images captured by EPIC to create the “true color” view of Earth and the moon, approximating what the human eye would see from DSCOVR’s station. 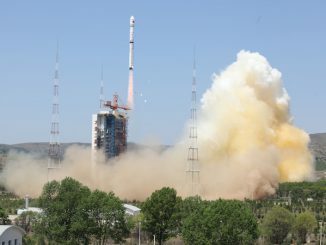 The camera has 10 spectral channels from ultraviolet to near-infrared, and the the visible red, green and blue channels were combined to create the pictures released by NASA on Wednesday. There are slight artifacts in the image caused by the processing, with a green sliver appearing on the right limb of the moon. 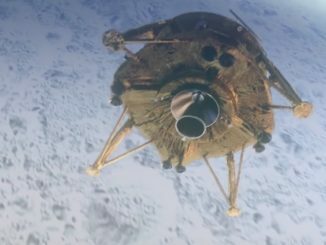 The images combined to form the natural color photo were taken by EPIC about 30 seconds apart, and the moon’s position changed as the camera recorded the views with the red, green and blue filters, NASA said. 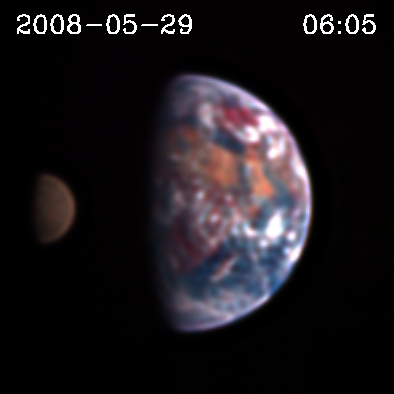 DSCOVR is not the first spacecraft to record the moon transiting the Earth, but the views from the newly-launched observatory are much sharper than a similar view captured by NASA’s Deep Impact interplanetary probe in 2008. The photos from DSCOVR show the lunar far side, which lacks the bright highlands and dark basaltic plains, or maria, that mark the side of the moon always visible from Earth. Features seen by DSCOVR include Mare Moscoviense on the upper left of the image and the lava-filled Tsiolkovskiy crater on the lower left, according to NASA. Regular observations of Earth by the EPIC camera will begin next month, and NASA says the images will be posted on a dedicated public website within 12 to 36 hours of their acquisition. The power of near-continuous images showing Earth rotating through day-night cycles was envisioned by former Vice President Al Gore, who in 1999 proposed a satellite mission to monitor the planet from deep space. 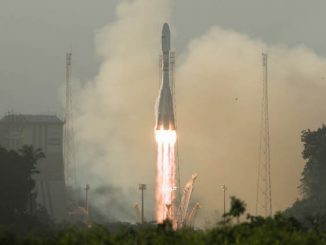 The satellite ran into political opposition, and the nearly-complete craft was mothballed until it was taken out of storage in late 2008 as NOAA studied repurposing it for space weather forecasting. The Air Force signed on to pay for its launch in February aboard a SpaceX Falcon 9 rocket.